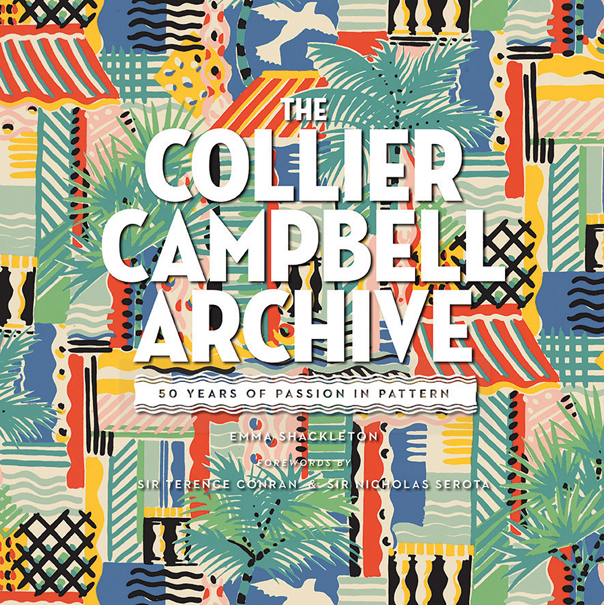 An Art Gallery In Your Own Home - Reviewing "The Collier Campbell Archive: Fifty Years of Passion in Pattern". An Art Gallery came to visit our post office, yesterday and when I opened it, everyone in the place came over to look. Naturally, they wanted to turn their own pages and with coffee cups cast aside and mail forgotten, two would hold the book up for the audience to gasp at and then they would say, "Okay, now it's our turn to look and you hold." That's the kind of response this beautiful book is guaranteed to elicit and for that reason, it should be in every library and not only in reference, please. We all need to see it and enjoy it. When I brought the book home, I thought, "hmm and now I should decorate every room, revise my closet, appreciate the views from my windows and buy new collections of sheets and towels. Oh yes and put all of the 30,000 sketches, designs, patterns, fashions and, and, and, all in my digital picture frame so I can relish just one or see them all over the next million years. There's just that much I want to see and learn. The Collier Campbell Archive is brilliantly authored and edited by Emma Shackleton with Sarah Campbell. Shackleton's extensive experience in the visual arts and with gallery collections is so obvious. Every picture is titled, dated and explained concisely so that whole book tells the complex story of two sisters who worked collaboratively and creatively for fifty years. I can see from the exacting detail, gorgeous color and enchanting designs, how Sarah Campbell continues to share her talent, resulting in yet another collaboration. Note that she is available for interviews. I can't wait! I love too, how the book is dedicated by Sarah to her beloved sister, Susan. This book is Art: movable, wearable, touchable, inspiring and alive. It is not a shelf book but one that should be open, used in multiple ways and as a resource for all ages. Very practical features include an index at the beginning and a synopsis of key dates, collaborations, projects and awards, all at a glance and page referenced at the back of the book. A transparent, durable plastic jacket will protect the gorgeous fabric front and back covers. This treasure would make a wonderful gift, prize, piece of art (think framed photo of cover or any page) or on a gold, bronze or silver podium, at the entrance to any gallery, new building, art/design school - the possibilities are endless. There isn't one page that doesn't invite one right i to a multidimensional world, filled with color, pattern and design. Concepts that are near and dear to Susan Collier and Sarah Campbell are creating, inventing and exploring and they were encouraged and supported to develop their interests and talents from a very young age. 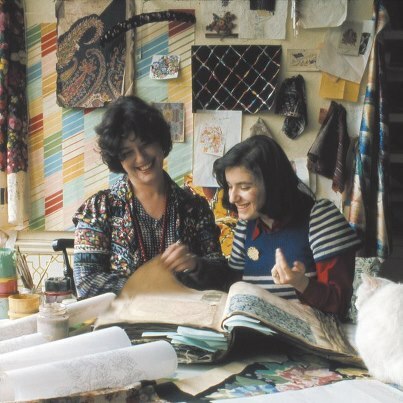 When I saw their designs and brilliant colors transferred to textiles, clothing, housewares and wallpaper, I remember bringing home second hand wallpaper books and an old doll house for my daughters. They immediately began to decorate, make clothes for the families and draw views to paste on the windows. I wish I could have told them about two other girls who were so passionate about working together to put their own stamp on textiles and to build their own business and get credit for their achievements by having their own labels, design houses and patents. Young children want to spend their time productively, to have the opportunity and time to create and certainly to be recognized for their inventions and explorations. I also remember one daughter starting a project about Christopher Columbus and drawing her own foot on the cover. When I asked her why, she said: "It will be more interesting if I am the explorer." As a fashion blogger, I have noticed the recent trend of mixing patterns. It's all about the color co-ordination and about being careful about knowing which colors are most flattering closest to the face. With the Collier Campbell designs, even black and white are colors and very special ones. To them, "...garments were to be easy, versatile and enjoyed." Again, there one gets a sense of the broad strokes of the paintbrush rather than the confines of a stencil or machine made product. And yet, there is precision, skill, definition and unique movement or life in every design. Sailboats float, birds fly, trees move in the wind, flowers grow in profusion and not in bunches, landscapes appear and folk art is celebrated. Yves St. Laurent obviously saw this when he selected two of their patterns as part of his first 1971 collection. There is so much more to write about, but you need to do your own exploring and creating. You can start by looking at a few of my favourite pictures here, but they won't be enough. Buy the Collier Campbell Archive and have a party. Guaranteed, it will not sit on your coffee table for more than a minute, if that. This beautiful book will be available in stores NEXT WEEK! Click here for more information.